A Parish Mission Statement is a concise expression of a parish’s purpose for existence. 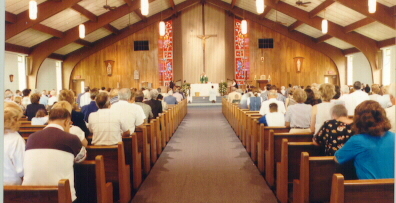 It helps the parish identify itself as a community of faith and set broad goals. It responds to the questions: Who are we as a parish? What do we value? What do we seek to become as a parish community? The Parish Mission Statement is rooted in the mission of the universal church and the Archdiocesan Mission Statement. Developing a Parish Mission Statement and periodically reviewing and revising it is a function of a Parish Pastoral Council. Since this is the Parish Mission Statement and because all parishioners are called to participate in the mission of the Church, the parish should be involved in the development of the Mission Statement. When the Parish Mission Statement is finished, the Council continues the pastoral planning process by assessing the parish’s strengths and needs and by setting broad goals and priorities which are rooted in the Mission Statement.